The Selous Scout Regiment had a short operational history, but under the inspired leadership of Major (now Lieutenant-Colonel) Ron Reid Daly, its members won a fearsome reputation as the best bush soldiers on the African continent. 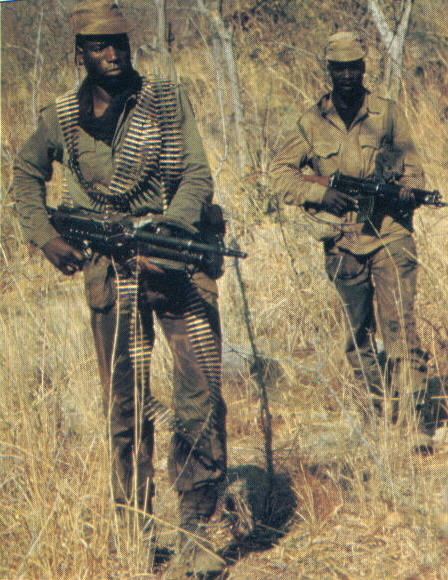 The regiment acted as a combat reconnaissance force; its mission was to infiltrate Rhodesia’s tribal population and guerrilla networks, pinpoint rebel groups and relay vital information back to the conventional forces earmarked to carry out the actual attacks. Scouts were trained to operate in small under-cover teams capable of working independently in the bush for weeks on end and to pass themselves off as rebels. Each man had to be a loner, capable of living alone in the bush, but also able to work as part of a team. It was essential that basic training weeded out the weak and singled out the finest, most suitable recruits. Selection for the Scouts was rigorous and even tougher than the SAS course. As soon as volunteers arrived at Wafa Wafa, the Scouts’ training camp on the shores of Lake Kariba, they were given a taste of the hardships they would have to endure. On reaching the base, tired and soaked in sweat - the trainers had ordered them to run the final 25kms —they saw no cozy barracks, no welcoming mess tent, but only a few straw huts and the blackened embers of a dying fire. There was no food issued. From this point instructors set out to exhaust, starve and antagonize the recruits. They usually proved so successful that 40 or 50 men out of the original 60 regularly dropped out in the first two days. Seventeen days of pure hell was the basic course. Every morning, from first light until 0700 hours recruits were put through a strength-sapping fitness program and barely had time to take a rest before having their basic combat skills sharpened. The day ended with the men having to run a particularly nasty assault course designed to overcome their fear of heights; and then, as soon as darkness fell, night training began. The last three days of basic training were given over to an endurance march. Each man had to carry, apart from his weapons and a few rations (125g of meat and 250g of mealie meal), a pack loaded with 30kgs of rock over a distance of 100kms, The rocks were painted green, so they could not be discarded during the march and replaced with others nearer the finish. To make doubly sure of their stamina, the final l2kms was a speed test. This section had to be covered in two-and-a-half hours — it meant the men had to push themselves all the way. The few men who finished the first stages of training were, after a week’s rest, taken to a special camp to undergo the ‘dark phase’. If the Scouts were to be effective it was recognized that they would need to look, act and talk like real guerrillas. The base was built and set out as a rebel camp and instructors were on hand to turn recruits into fully-fledged members of the enemy. ‘Pseudo-groups’ — Rhodesian troops posing as rebels — were the main active units of the Selous Scouts. In the ‘dark phase’, they were taught to break with habits like shaving, rising at regular times, smoking and drinking, and to adopt a guerrilla lifestyle. Everything from the ritual slaughter of a goat (by partially slitting its throat before strangulation), to walking through the bush in single file, was taught. Vital information on the operational methods of rebel units in the field (such as their preference for arranging meetings by letter), uniforms, weapons and equipment were gathered from killed or captured guerrillas. Although black soldiers of the Scouts were the spearhead of any pseudo-group, and had most direct contact with the enemy, white officers tried to pass themselves off as black — at least at a distance. Blacking-up, using burnt cork or theatrical make-up, wearing a large floppy hat and growing a beard, were all devices that helped to hide the more obvious European features. The recruits who survived the training program had little time for self-congratulation The Rhodesian security forces needed every man they could muster to combat the growing menace of the nationalist guerrillas and hastily formed units known as ‘sticks’, consisting of one or two white officers and up to 30 black soldiers, were dispatched into the bush to seek out the enemy. In such delicate operations it was essential that the rebels did not know of the Scouts’ presence. Unusual movement by road, or air would give the game away, and so Scouts were dropped by covered lorry or helicopter, at night well outside a suspect area, and, making full use of their bush skills, moved in on foot. Once in position, a camouflaged observation post would be established on a convenient hill with a good all-round view. It was at this stage that the Scouts bush skills came into their own. For the men on the ground there would be no resupply for many weeks; they had to find food, live undetected, track and make contact with the enemy without revealing their real identity. The Scouts used information gathered by attached police Special Branch units to make contact with the guerrillas. While the white officers stayed at the observation post, emerging only at night to hear reports, give orders and relay any valuable information back to base, black Scouts would move into a village disguised as rebels and try to meet the local contact-man. Contact-men gave the guerrillas food, shelter and information. It was often an easy matter to find the right man; the Scouts always had good intelligence on the enemy and several of them were ‘turned terrorists’ — former rebels who had been captured, made an offer they could not refuse and sensibly decided to join the regiment — who had first-hand knowledge. The usual drill was for the Scout group to be accepted by the contact-man and, once they were, to arrange meetings with other local guerrilla groups at a particular time and place. It was not always that easy, as many contacts were suspicious of their unannounced guests and the Scouts had to go to extreme lengths to prove their loyalty to the rebel cause. On one occasion the Scouts staged a mock night attack on a white farmhouse to convince both the security forces, and the rebels they had contact with, that they were guerrillas. Indeed, they went to the extent of covering the area with blood and dead bodies were provided by play-acting Scouts whose ‘corpses’, poking out from beneath a blood-stained sheet, convinced everybody of the ferocity of the battle. On another occasion, a white officer pretended to be a prisoner of his black soldiers and endured several beatings to convince the rebel troops of his men’s commitment to the nationalist cause. Meetings were often set up, via the contact-men, with local rebels, meetings which were the opportunity to strike at a band that had infiltrated Rhodesia, but the Scouts themselves never attacked guerrillas if they could help it. Their firepower and combat skills with captured equipment were more than a match for that of the enemy, but all their hard work in getting themselves accepted in a particular area would have been wasted if they took a hand in any action to destroy a guerrilla force. Reid Daly decided that the killing had to be done by helicopter-borne units of the regular army. ‘Fireforces’, consisting of a helicopter gunship, three troop-carrying helicopters and a paratrooper Dakota, kept the appointments set up by the contact-men. They would arrive suddenly and wipe out the enemy. Many of the officers and men of the regiment came from the rural areas of Rhodesia and were past masters at tracking, but it was not always an easy matter to switch from hunting wild animals to stalking the far more dangerous terrorist groups. On cross-border reconnaissance, Scouts tracked guerrilla units for anything up to a week, searching for signs of guerrilla activity, especially in the morning or early evening when the sun’s slanting rays highlighted even the slightest sign of movement. They paid particular attention to any evidence of disturbed vegetation and kept a careful watch for the sole prints of the enemies’ shoes in the dust. Any game that was caught or found dead, and plants or roots— Scouts had been taught to distinguish the edible from the poisonous —. provided food. Scouts were forbidden to shoot animals as too much noise in the bush might give their position away. Fires, if lit at all, were made from bone-dry kindling that did not give off smoke, At night Scouts dug a 300mm-deep pit in the ground to hide the fire — even the tiny flickering of a dying ember can be spotted at up to 800m in the dark, and this could have the most disastrous consequences By making full use of Reid Daly’s ideas the Scouts managed to maintain their cover and severely damage the African nationalists’ war effort in Rhodesia. It soon became clear, however, that bases in neighboring African countries such as Mozambique and Botswana still posed a major threat to state security. Small units of Selous Scouts, working in conjunction with elements of the regular army, were ordered to carry out a series of cross-border raids. Columns of armored cars, troop carriers and buses penetrated deep into enemy territory. 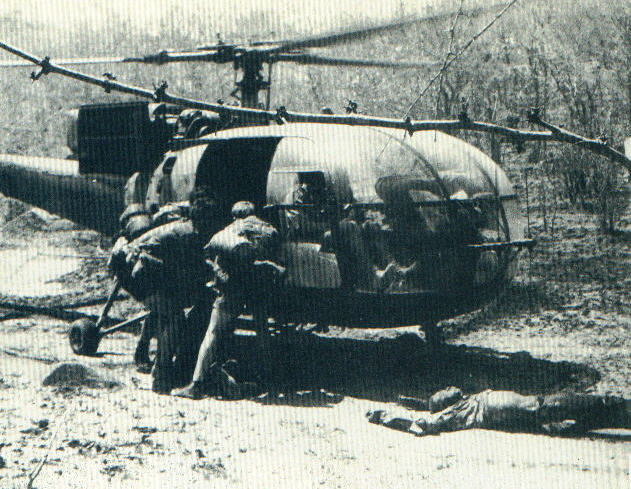 The most famous raid, carried out with the Scouts’ usual skill and daring, was on the rebel base of Pungwe/Nyadzonyain Mozambique. In August 1976, 72 Scouts, in 10 Unimog trucks and three Ferret armored cars, attacked over 5000 guerrillas. They calmly drove into the camp where they were welcomed by the enemy. Suddenly the rebels realized their mistake and all hell broke loose. The Scouts opened up with everything they had, and by the end of the battle some 1200 rebels had been killed, while only five Scouts were wounded. Many other raids of this type were carried out before the regiment was disbanded in 1980. Reid Daly’s unorthodox approach to counter­insurgency operations made him extremely unpopular with officers of the regular Rhodesian forces. Several high-ranking officers believed that the Scouts were more trouble than they were worth and had, on occasion, endangered the lives of members of the army. Worse was to follow, on 29 January 1979, all Selous Scout operations were cancelled after a bugging device had been found in Reid Daly’s office. Two days later he launched a personal and public attack on the army commander, Lieutenant General John Hickman, that resulted in a court-martial. Although Reid Daly was given only a minor ‘reprimand, he resigned his command. In their short history the Scouts inflicted great losses on the enemy yet, because of the inevitable secrecy that surrounded their operations. 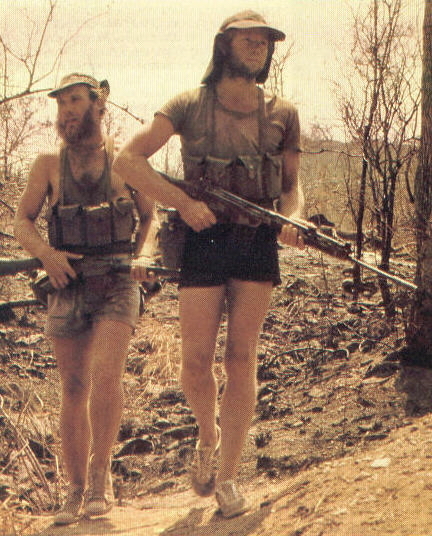 few Rhodesians knew of their existence: It was not until the end of the war, when Combined Operations, Rhodesia, issued a statement that credited the Scouts with responsibility for 68 percent of all rebels killed, that the scale of their success was publicized. In less than seven years of almost continuous combat the Selous Scouts lost only 36 men killed in action, but had accounted for several thousand guerrillas. THE AUTHOR Peter Stiff was an officer in the Rhodesian Police Force for 20 years, and has written a number of authoritative books on the Rhodesian War. Two best-sellers, Selous Scouts Top Secret War and Selous Scouts—A Pictorial Account, are published by Galago Publishing (Pty) Ltd, P0 Box 404, Alberton 1450, Republic of South Africa.